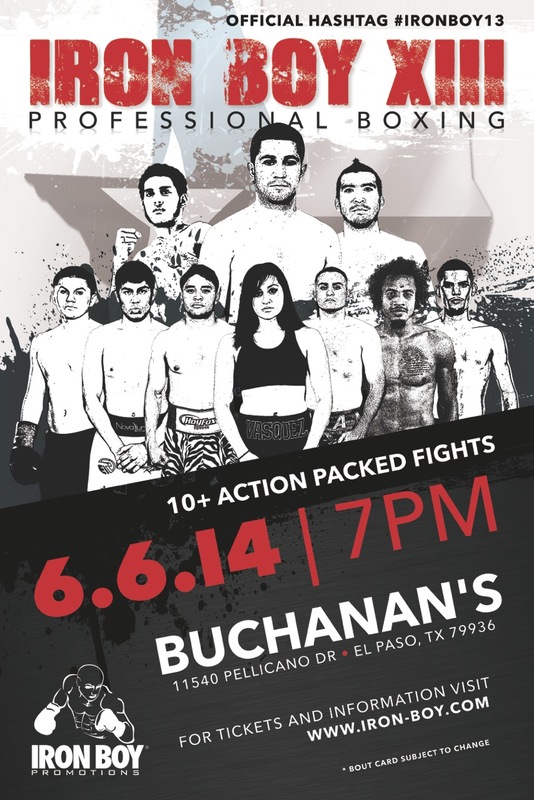 The popular Arizona-based boxing company, Iron Boy Promotions, will be making its way outside of the state when its event Iron Boy XIII debuts in El Paso, Texas, Friday June 6th at the Buchanans Event Center. The promotion first debuted in 2012 and has held all 12 previous Iron Boy Promotions cards at the Celebrity Theatre in Phoenix, Arizona. The theatre had become a hub for the promotion which is now ready to expand with Iron Boy XII, their first event out side of The Grand Canyon State. June 6th’s card is set to feature a slew of up and coming young boxing talent. In the main event El Paso’s undefeated light welterweight Oscar Valenzuela (6-0-1, 3KOs) faces Mexico’s Alexis Del Bosque (3-1, 3KOs). A very good match-up pins hometown boy Carlos Villa (5-1-1, 3KOs) and Albuquerque’s Matthew Baca (4-1-2, 2KOs). Fans will finally be seeing the professional debut of New Mexico’s greatest amateur boxer of all-time, 11-time national champion, Ayanna Vasquez of Las Cruces, New Mexico who will be facing fellow debutante Jasmin Quesada of El Paso, in a battle of I-10. Also expected on the card will be Arizona standout boxers Carlos Castro (5-0, 2KOs), David Benavidez (4-0, 4KOs), and Siju Shabazz (4-1, 4KOs), a former New Mexico amateur standout from Las Cruces, now living in Phoenix. General admission tickets for this event– priced at just $25– are already on sale and can be purchased by visiting the Buchanans Event Center or by clicking here. Fans are encourage to use the hash-tag the even as #IronBoy13 on social media. The company expects to promote another five boxing events in 2014, three in Arizona and two in Texas. As Iron Boy XIII approaches SWFight.com will be providing pre-fight coverage and interviews. Make sure to follow us on Twitter at @SWFight.